Aorus unleashed this beast, the X7 Pro and it got us thinking, is this just another gaming laptop or does it have more to offer? The design and quality build screams gaming as it does not want to be locked up in an office room. Sporting an intimidating all black exterior and two graphic cards powered with a 4th Generation Intel Core i7 processor, the Aorus X7 Pro is definitely a performer. The real question is: Is it worth the price? The Aorus X7 Pro will definitely turn heads with its striking design and the company’s eagle logo right in the centre of the lid. Resembling the beak of an eagle, the lid’s surface isn’t totally flat as there is a triangular bulge on the top with a slight fade of white paint. 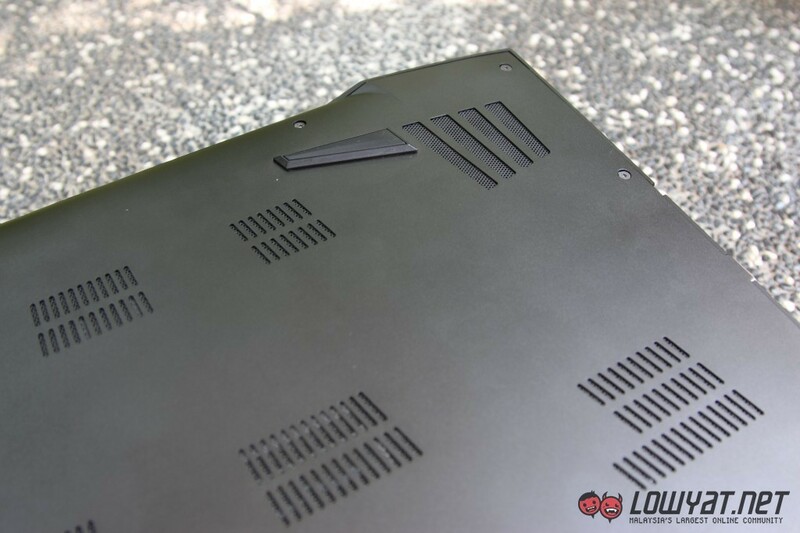 Users will be impressed with the Aorus’ full metal body as well as its trackpad panel made of glass. It is definitely nice to have one, but it does have its quirks – more on that, later. 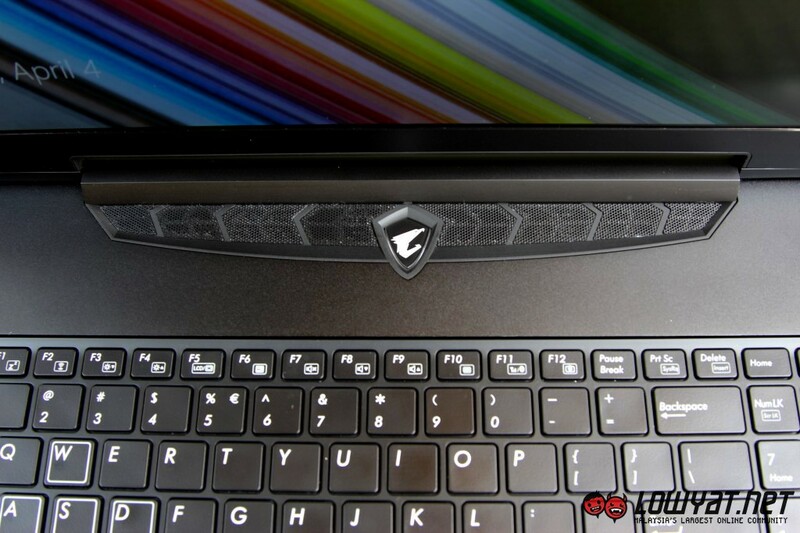 Measuring only 2.29cm thick and weighing a hefty 3kg, it is not the thinnest or lightest gaming laptop out there. 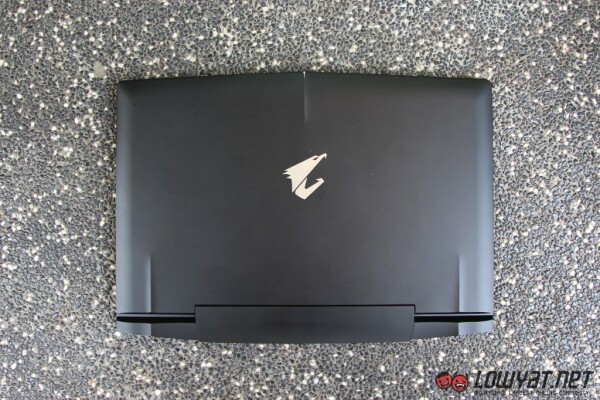 The Aorus X7 Pro might not be a wise choice for those looking for a light laptop, as it does not sacrifice form factor for performance. Nonetheless, the company did a remarkable job at finding the balance between design and performance. It may be slightly heavy, but users won’t always be gaming on the go anyway. 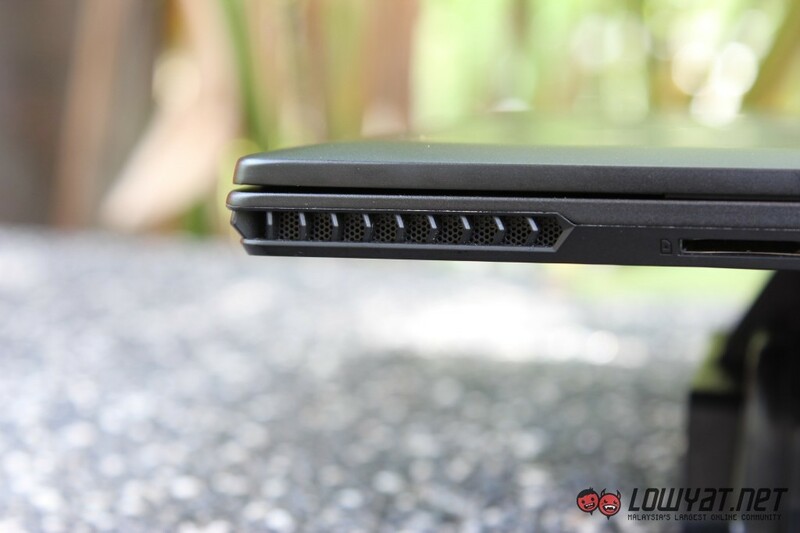 The left side of the laptop is where the Ethernet port, HDMI, VGA, USB 3.0 port and the 3.5mm jack and microphone jack are placed. 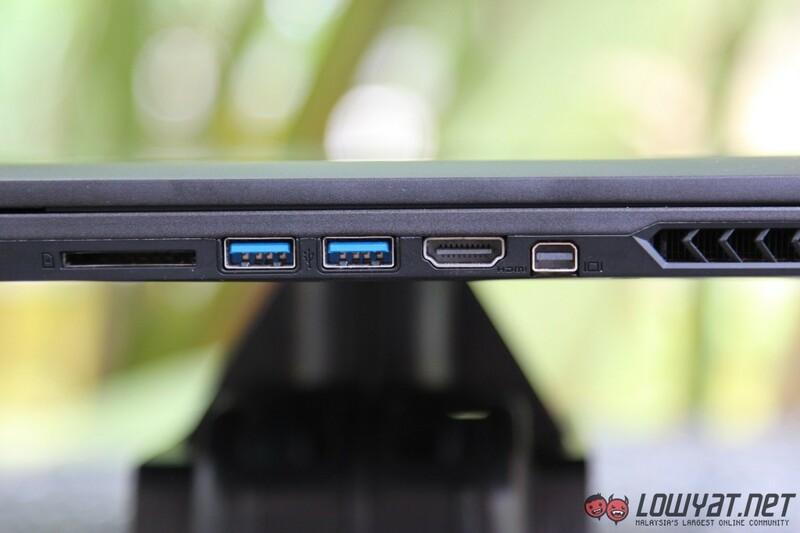 There is another HDMI port, along with the Mini DisplayPort, two USB 3.0 ports and an SD card reader on the right side of the laptop. All that’s left is the power jack and two extra USB 2.0 ports on the back. 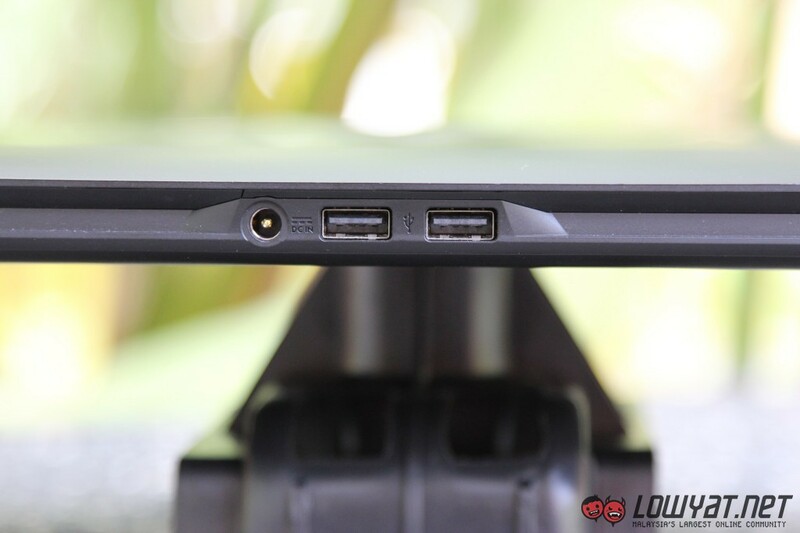 I like the placement of the ports because of how easily accessible they are. There is also a HDMI port on each side to allow for easier external monitor connectivity. 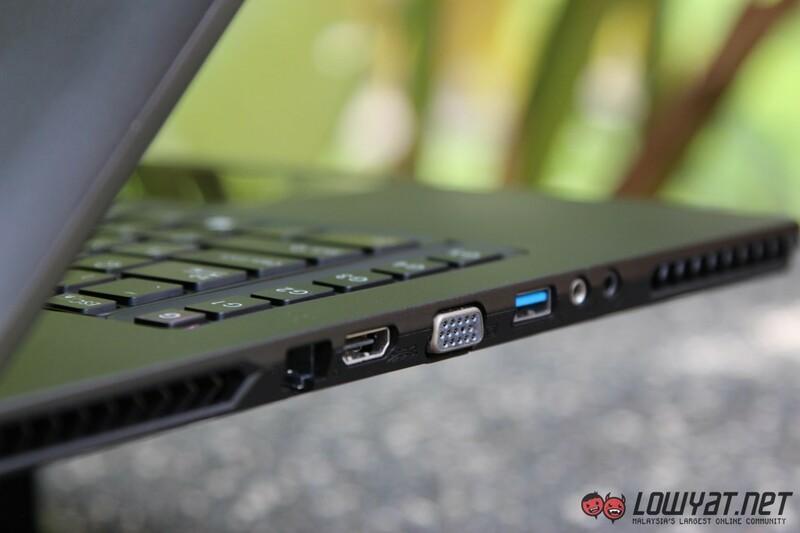 Not only that, all USB 3.0 ports are placed on each side of the laptop so the user can easily hot-swap their USB devices like external HDD or thumbdrive. Two of the USB 2.0 ports are placed at the back, which makes sense because it is likely to connect devices that are unlikely to be moved around a lot, such as a mouse. Users will find that all ports are spaced out proportionately so the users won’t need to readjust their USB device’s position. To be honest, the 17.3-incher has aesthetic elements which resemble a Lamborghini sport car. For example, the laptop is slightly raised at the back, leading to the rear exhaust vents that look pretty much like the tail lights of a Lamborghini. 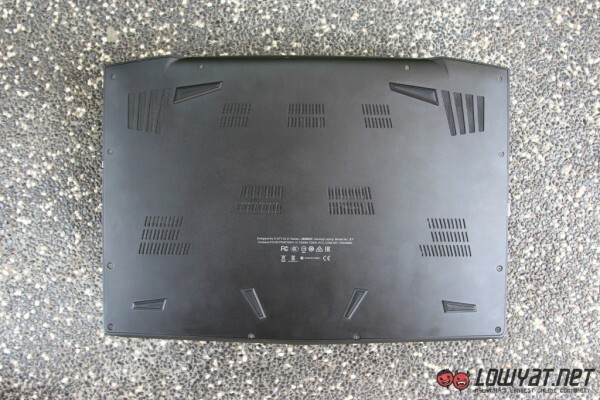 All exhaust vents, even the speakers, are protected by small chevron grills. 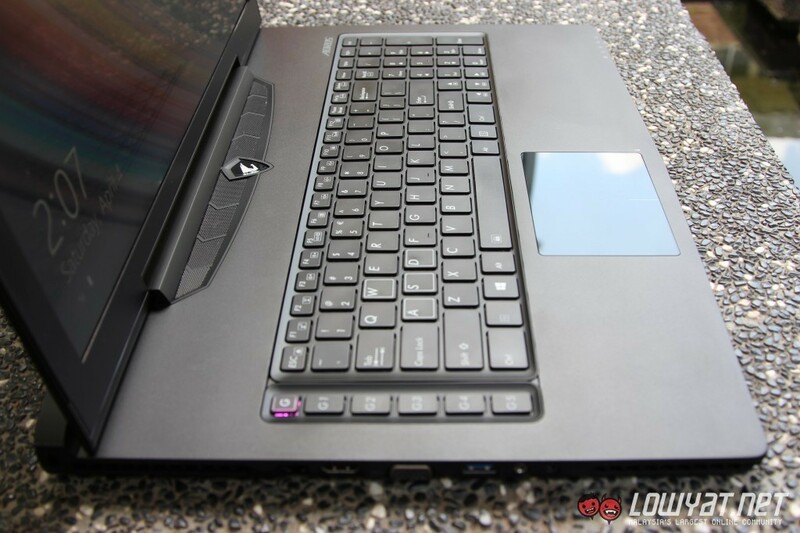 Once the lid of the Aorus is flipped open, users will be greeted by the 17.3-inch matte display, an awesome power button, and the keyboard and glass trackpad. 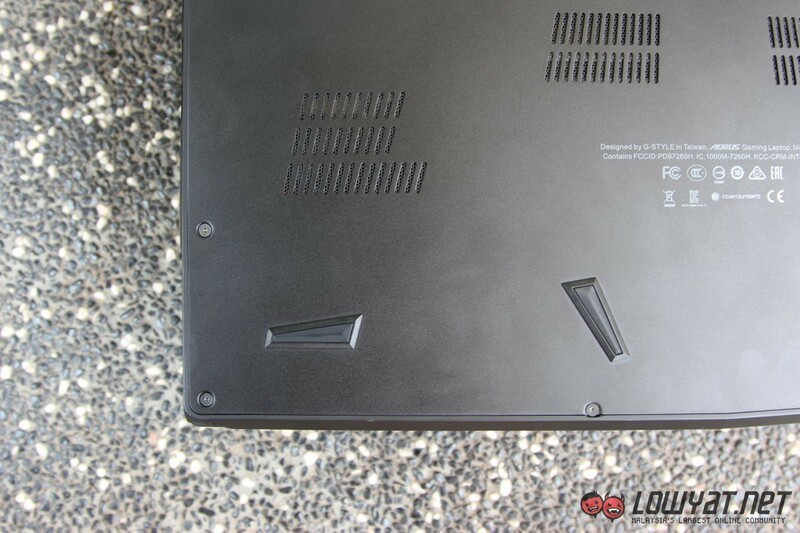 The bezel surrounding the display is made of plastic, unlike the metal the laptop is wrapped in. 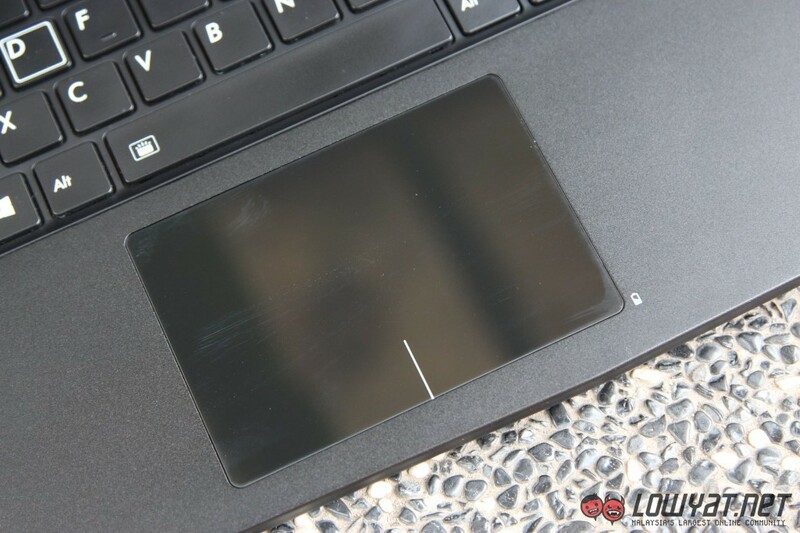 Having a matte display reduces glare and light reflection to avoid distraction and annoyances while viewing multimedia content or gaming on the laptop. The power button is placed dead centre, glowing slowly like a dragon’s breath. The keyboard is not fully backlit so gamers who like to game in the dark might find this a little disappointing. 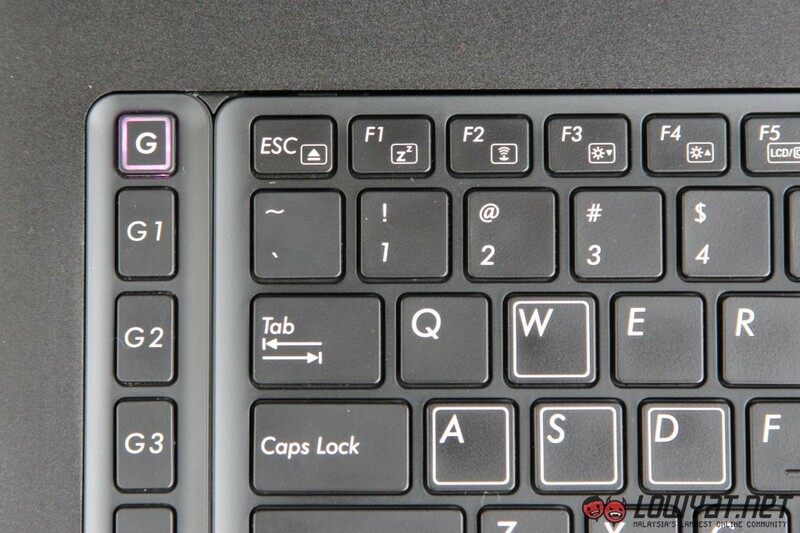 On the left, there is a row of macro gaming keys where only the “G” key lights up. We like how the WASD keys are accentuated with white squares. Not only that, the glass trackpad is also quite the looker with its reflective surface. The Aorus is a magnificently-built laptop as its best features are highlighted with subtle angles and the premium metal frame it is wrapped in. It has solid built quality, making it hold its ground rock steady. 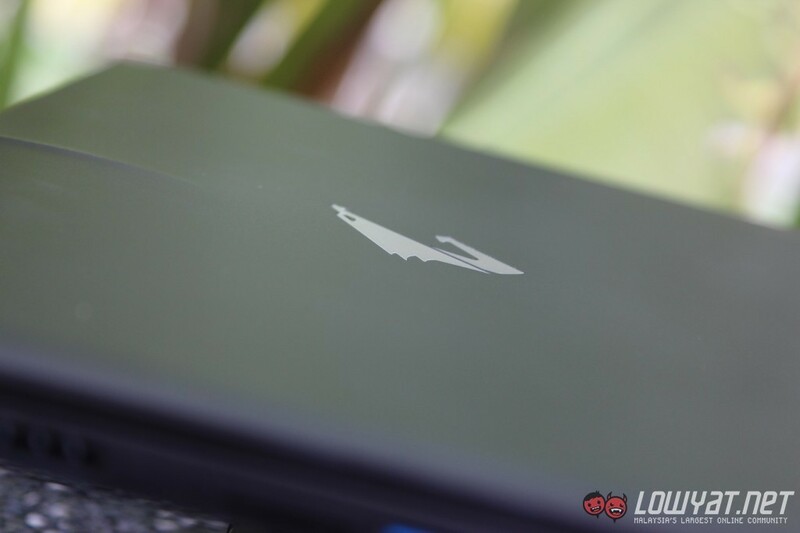 The Aorus X7 Pro has a pretty fast boot up time, mostly thanks to its 512GB SSD. When we started up the laptop for the first time, we timed the boot up sequence just to make sure. It took only 13 seconds for the laptop to boot up into the desktop screen. In terms of display, the laptop has a 17.3-inch Twisted Nematic (TN) panel screen which delivers better blacks and color depths compared to IPS screens, in our opinion. Colours displayed on the monitor really popped on the display, making the graphics look even more real during gameplay. We liked the implementation of a matte display as it performs better in preventing glare, giving users uninterrupted gaming sessions. Users should not be worried about the display consuming too much of the battery life, as the brightness level can be turned down to the minimum level where barely anything can be seen on the screen. That being said, the brightness can also be cranked up to a maximum brightness of 318 cd/m², should the gamer require that level of brightness. We somewhat liked the keyboard in the sense that the keys are isolated proportionately. Some of the gripes we had with the keyboard was that the right shift key was too short. We found ourselves constantly clicking blanks when trying to execute a Window command or even walk in Counter-Strike, which can get rather annoying after a while. 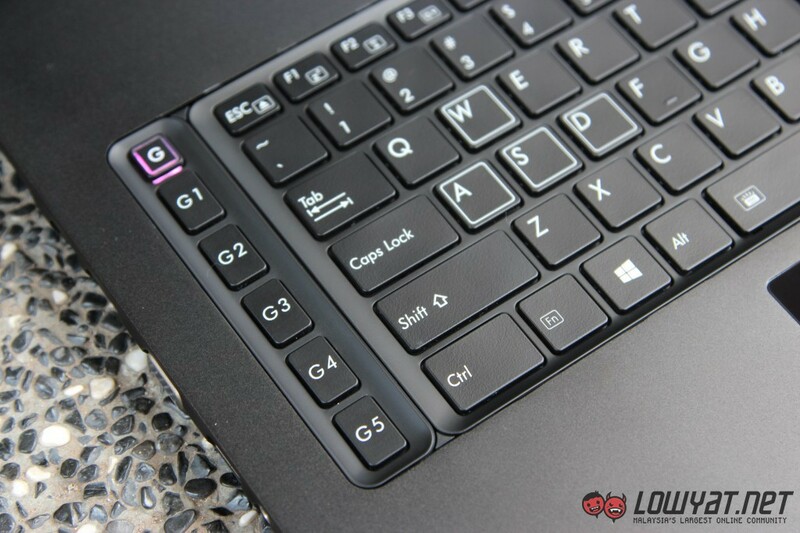 On the other hand, the arrow keys are the perfect size and the keys are more silent than other laptops. 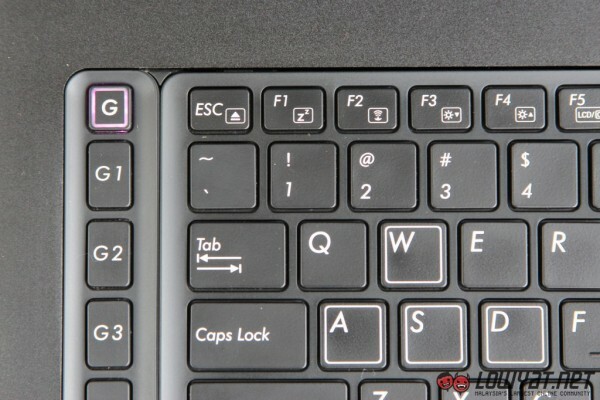 The macro keys are quite hard to reach, as it is spaced a little too far out, so sometimes users might misclick the Tab key or Caps Lock, instead of performing an Ultimate or buying weapon. The trackpad does look stunning with the reflection based on the angle users look at it, but it can prove to be a little uncomfortable to use. The dedicated left and right click buttons on the trackpad work just fine, but it would be better if the click can be extended further into the touchpad, instead of just at the left and right bottom corner. Not to mention, the glass surface is not exactly smooth to the touch so users might just want to stick to their mouse. Heat and Noise. 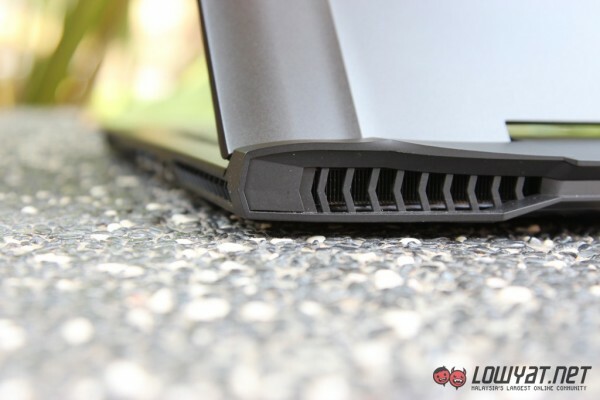 That’s the worst problem on the otherwise great gaming laptop from Aorus. Gaming sessions would of course make the laptop heat up, but even watching a YouTube video will get the fans kicking, producing unnecessary amounts of heat and noise. 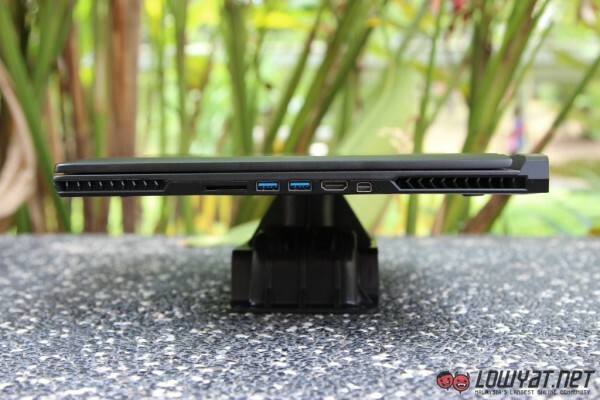 Luckily, the heat does not dissipate on the palm area but on the bottom part of the laptop instead. This, however, defeat the purpose of the laptop as the user cannot actually place it on their laps. Another thing that would grind the user’s gears is the noise it makes. The noise would make users think their vacuum cleaner got accidentally turned on – not kidding. This laptop is definitely not one of those cool and silent machines. In fact, it is more of a gaming beast which roars and growls, letting those around it know it is made for gaming. The audio quality on the X7 Pro is fantastic. I’ve tried playing music and gaming in different areas and the audio just shines through, delivering a full stereo experience, thanks to its dual-speaker and dual-woofer setup. Be it small rooms, large living rooms or even the park, the audio can be clearly heard. That being said, the bass does fade off as users proceed to larger environments. Having a Core i7-4780HQ processor and two GTX970M graphics card, the X7 Pro is expected to cut through benchmarking software like butter. 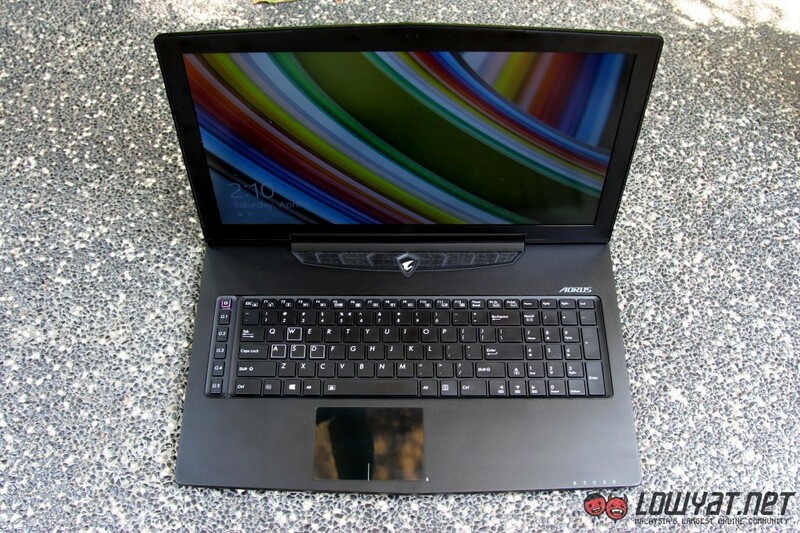 PCMark 8 was the first benchmarking software we put the laptop through. As expected, the laptop scored rather high points in the simulation of the typical consumer’s usage based on three scenarios – Home Conventional v3, Work Conventional v2 and Creative Conventional v3. However, during the test, users can feel the heat and hear the noise coming from the laptop as the fans start to kick in when the load is heavy. This means that most of the time gamers, like us, need to either have headphones on or sit further away from the laptop. Next up was 3DMark and again, the X7 Pro handled the test (almost) perfectly. 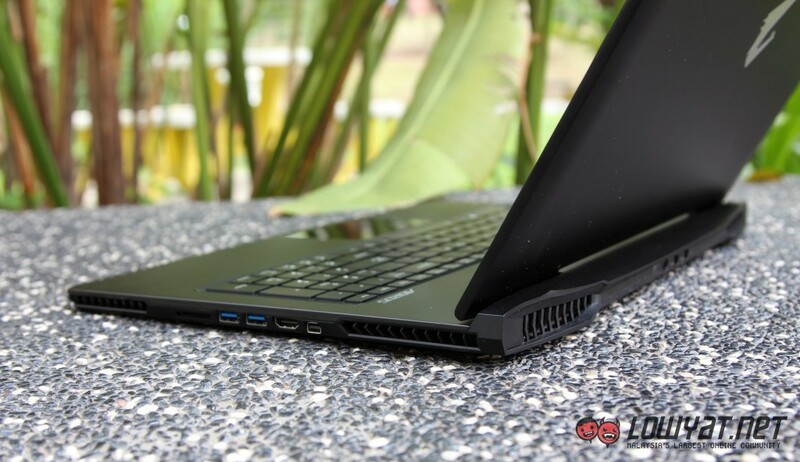 As shown in the benchmarking score chart, the laptop performed well in the Cloud Gate and Sky Diver test, scoring over 20,000 points. However, it is during Fire Strike Extreme and Fire Strike Ultra where the X7 Pro struggles to churn out those graphical details efficiently. We prepared five games to benchmark how well the laptop would perform playing some of the popular game titles out there. These games include Grid 2, Bioshock Infinite, Tomb Raider, Battlefied 4 and not forgetting, Crysis 3. As expected, the Aorus X7 Pro really did not disappoint. Despite the noise and heat issues, the laptop handles Ultra or Ultimate settings on each game like it was a walk in the park. It should be no problem for the Aorus to play the latest game titles available on the market right now. Users will be surprised with how smooth the game runs at the highest settings. Even when testing Crysis 3 on Ultimate settings, one of our writers even said, “Daaayyyuuummm, that is smooth” as the laptop managed to get an average 50.5 frames per second, which in our opinion is remarkable. The Aorus X7 Pro did not fare well in terms of battery performance. Lasting only an hour and forty minutes, it could barely play a full movie but if users were watching a miniseries, it might be able to play an episode and a half before shutting down. On the PCMark 8 Home Conventional battery life test, it achieved a runtime of one hour and thirty-six minutes, similar to the continuous 1080p movie playback’s test result. The most important aspect in testing a gaming laptop’s battery life is how long it can last playing games. 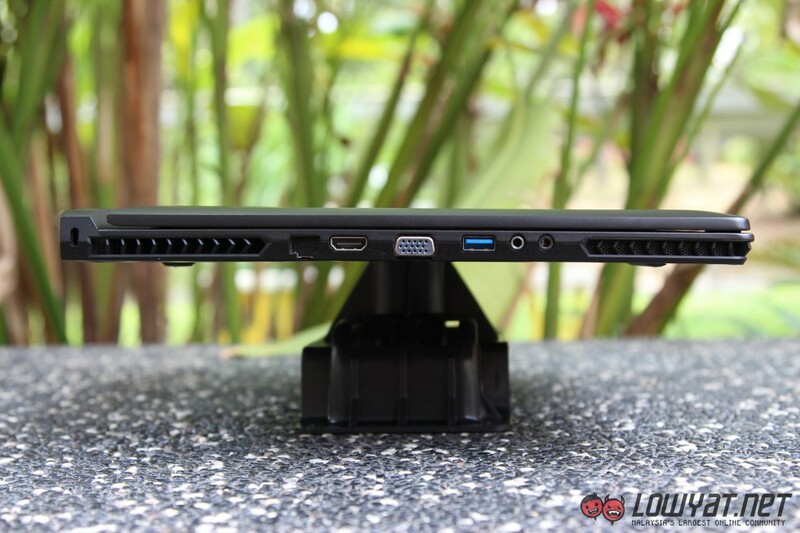 All we can say is that users would wish that powerbanks were able to charge the laptop. In our 3DMark Sky Diver Loop test, the laptop churned out great graphics but 55 minutes was the longest it could endure. Gaming sessions on battery will be short so users will need the power bricks to be brought along at all times, even if it is to attend a lecture in college. Speaking of the power brick, it weighs nearly as heavy as the laptop itself. 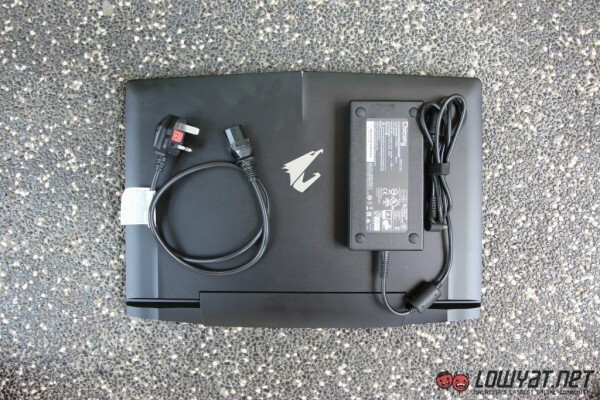 When we travelled around with the laptop and the power brick, our bags were so heavy we practically had to hunch our backs. It might be considered additional baggage to carry around, but users will be glad they did so. The ideal way to game with the X7 Pro is to connect it to the power brick so users need not worry about the battery depleting during intense boss battles. The laptop is not meant to be ultra-portable so, it would be wise to have the power brick nearby, just in case there’s no checkpoint in the game. 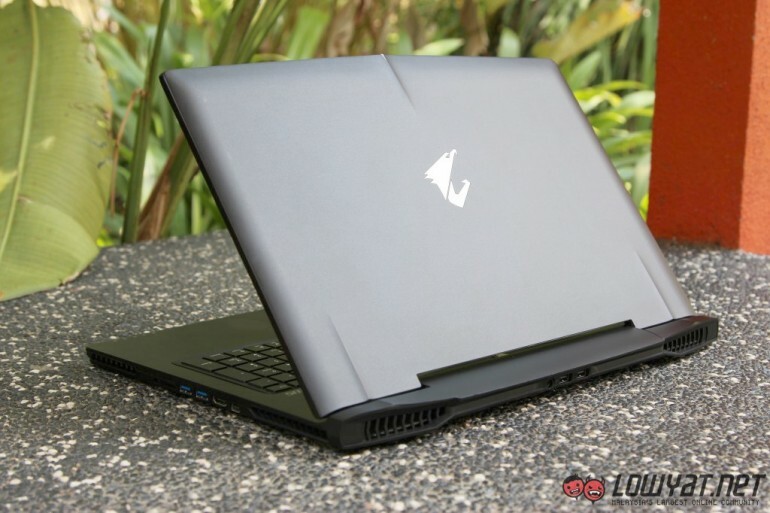 The Aorus X7 Pro is a lean and mean gaming machine, but it doesn’t mean there aren’t other choices out there. With the gaming industry hot on its track right now, more products are being pushed out as the competition gets tough. We’ll take a look at some of the other 17-inch gaming laptops out there with roughly the same price point, specifically from Razer and Dell’s Alienware gaming series. 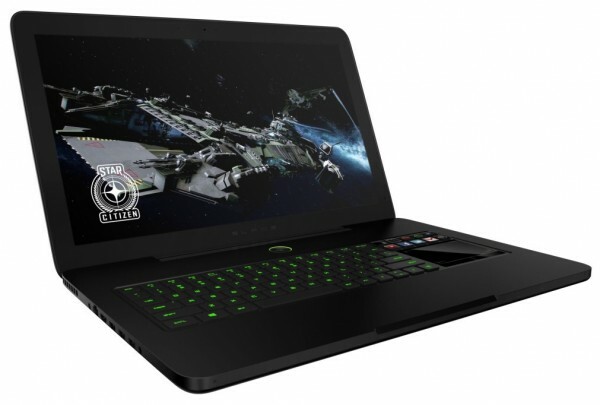 The Razer Blade Pro is a 17.3-inch gaming laptop that boasts how slim and light it is. 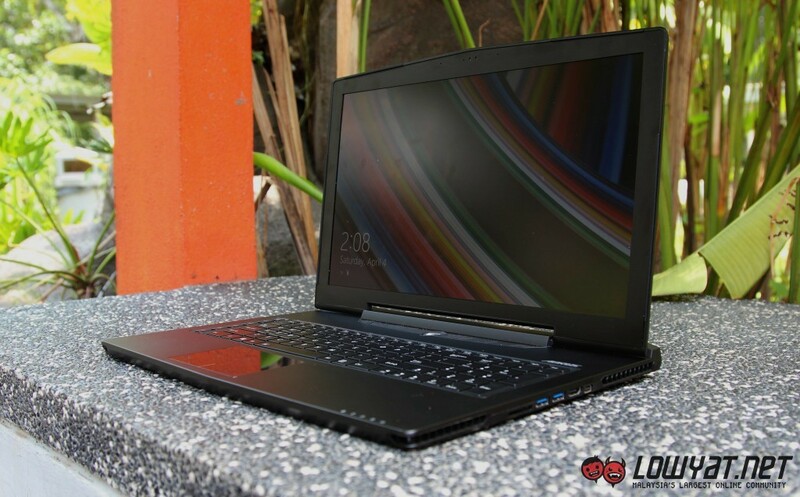 However, it does not weigh far from the X7 Pro as it also weighs 3.07kg For the price of RM9,399, the Blade Pro has a lower spec i7-4720HQ and a single Nvidia GeForce GTX 960M graphics card with 4GB DDR5 VRAM. Both laptops have 16GB RAM which are upgradable. However, it might be harder to upgrade the RAM on the Blade Pro. 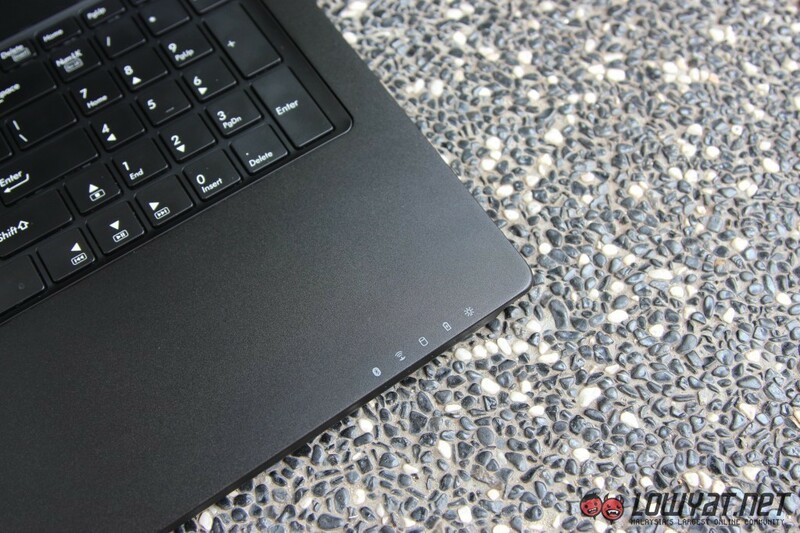 Not to mention, the Razer Blade Pro also has its proprietary Switchblade touchpad and is known for its status and great looks. 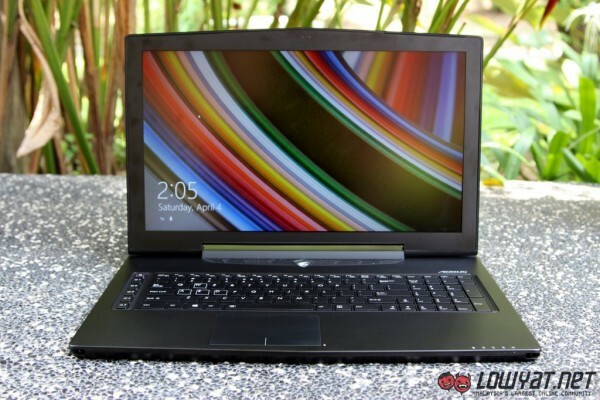 All in all, both these laptops are capable of high-end gaming, but if you are looking for a more aesthetically appealing laptop, then the Razer Blade Pro would be your choice. For those who want raw power and more bang for their buck, the Aorus X7 Pro is the way to go as an extra RM600 will pocket you an additional GTX970 for an SLI system and a slightly more powerful processor. Dell’s Alienware 17 gaming laptop is another machine that aims to give the Aorus X7 Pro v2 a run for its money. The Alienware 17 features a 17.3-inch Full HD display and 8GB of RAM, similar to the X7 Pro. 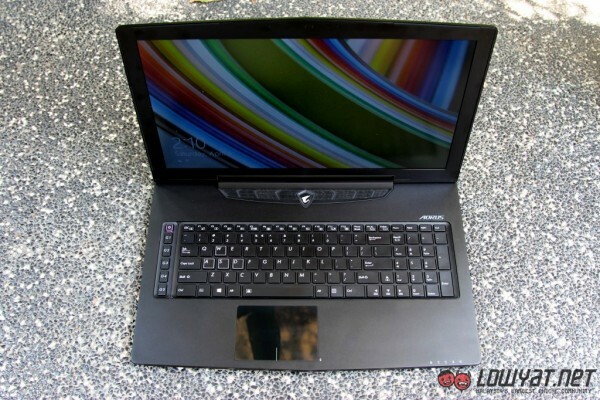 What sets these two machines apart would be the processor and graphics card, which are the heart and soul of a gaming laptop. 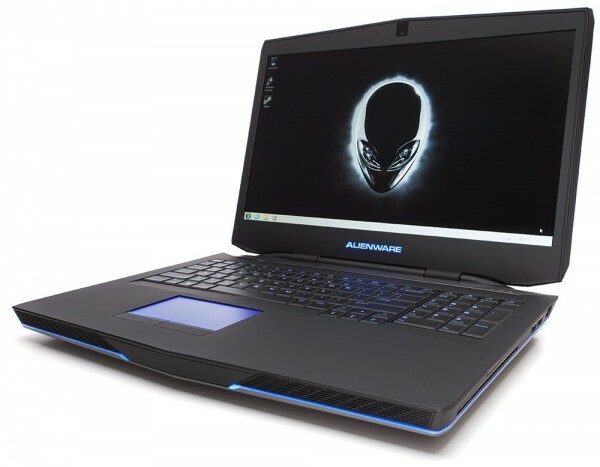 The Alienware 17 has an i7-4710HQ processor while the X7 Pro has an i7-4780Q processor capable of a higher 3.7GHz turbo clock speed. 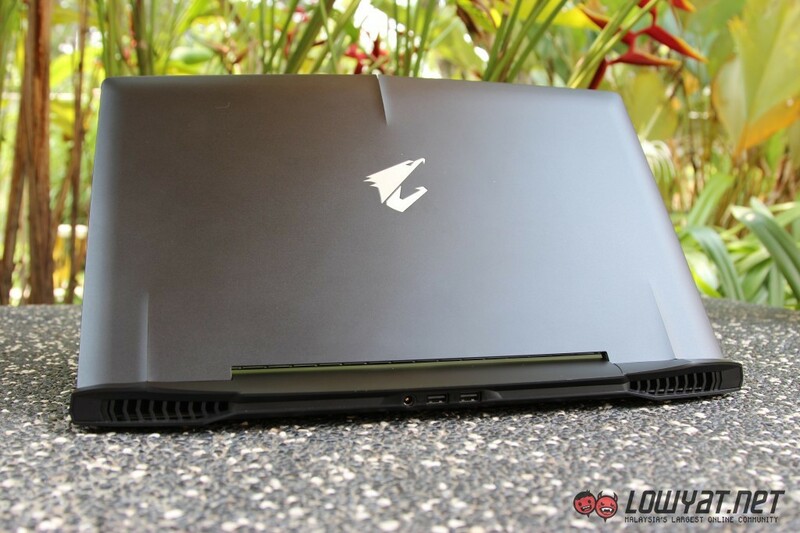 Also, the Alienware 17 has half the graphics power of the Aorus X7 Pro with only a single GTX 970M graphics card. 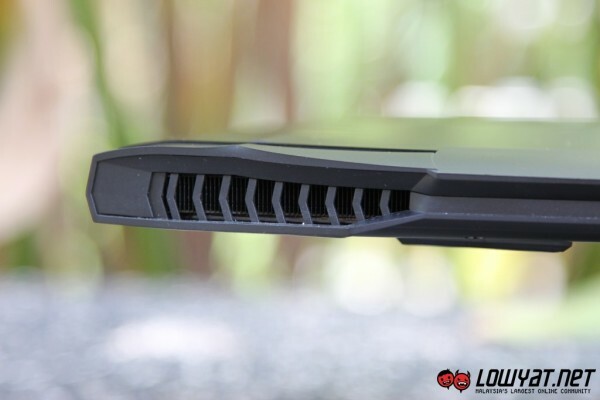 In terms of storage, the Alienware 17 only uses a 1TB HDD instead of a 512GB SSD found on the Aorus X7 Pro. Now, Dell is selling the Alienware 17 for RM6,676.99, inclusive of GST. Taking the price into consideration, it comes down to the users paying for what they get. The Alienware 17 might have half the graphics processing power and a slightly lower turbo clock speed processor, but it has the AlienFX illumination system and it is RM3,300 more affordable than the X7 Pro. That being said, the 512GB SSD is a major factor in the pricing of the X7 Pro. All these gaming laptops are definitely high performers in terms of gaming as well as day-to-day activity. They may have different prices but it is entirely up to the consumer to decide which hardware configuration suits them best. If money isn’t an issue, then the Aorus X7 Pro would be a great choice, but for those who are looking for a gaming machine on a sub-RM7,000 budget, the Alienware 17 proves to be a worthy option. 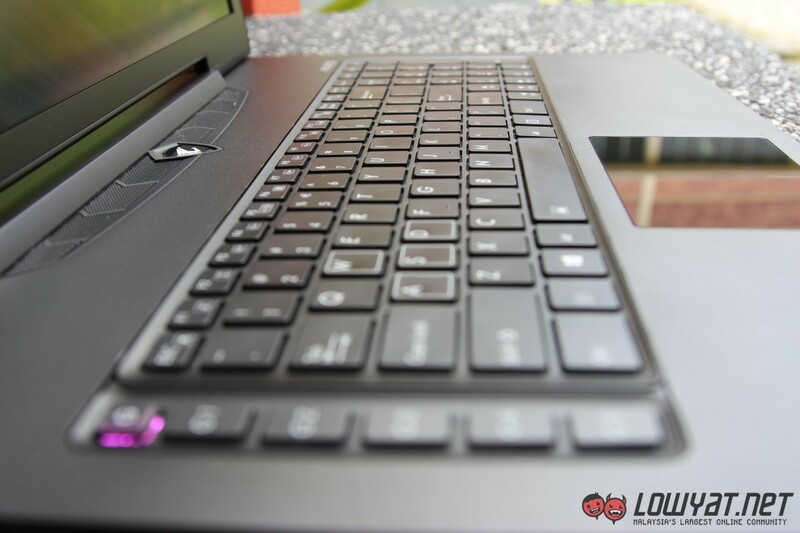 After putting the laptop through numerous benchmarks and testing, it is time to answer the final question that started this whole review. Is it worth the price? 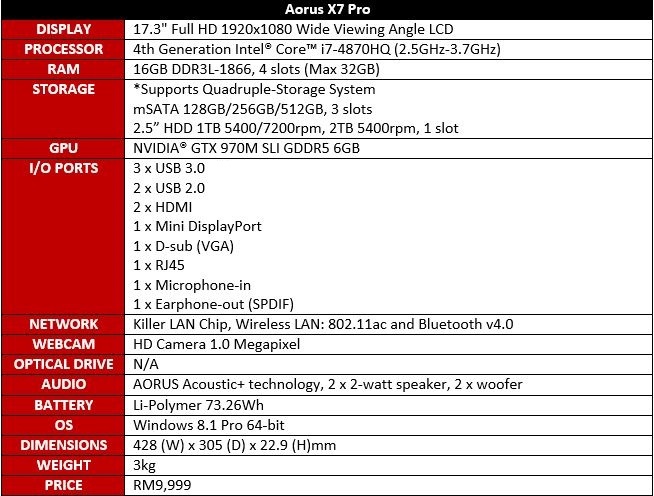 Based on our opinion, RM9,999 for the laptop sounds like a reasonable price. 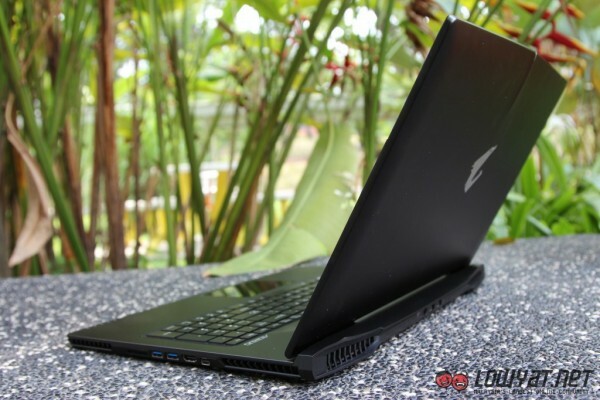 This is because the hardware the user’s getting is the best among its competitors, and it is packaged in a form factor similar to Ultrabooks – slim and thin. There is no doubt about its hefty weight, but it still is convenient in the sense that it is mobile and can easily be moved whenever you want to. 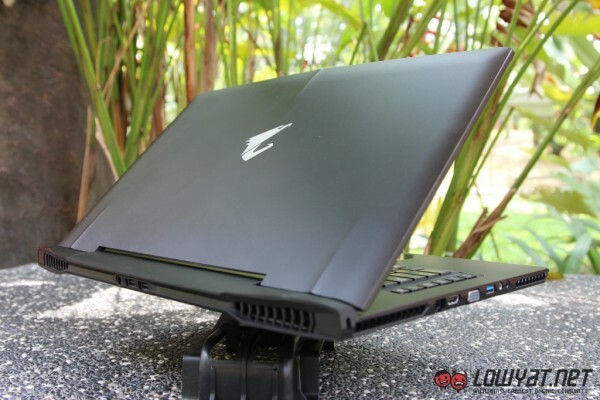 The Aorus X7 Pro really puts the ‘G’ in gaming with its outstanding performance, be it with games or daily work needs. 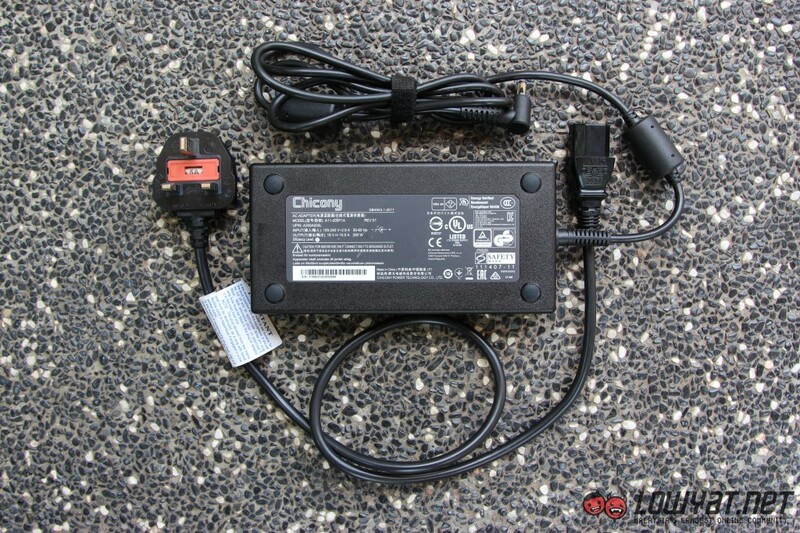 Just keep in mind that the power brick is one of the most important things users have to carry around as the laptop is not a marathon runner when running on batteries. There are ways to work around the noise and heat issue, but other than that, the X7 Pro really is a beast of a gaming laptop and it’s not afraid to show it.